A boxer who brings his legs with him comes to the ring with the strength and stamino to make it through every round of a tough fight. 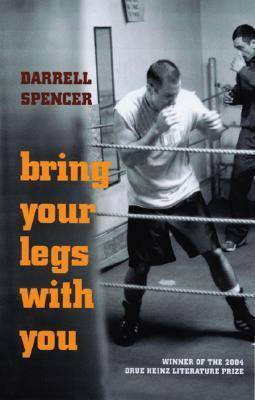 In this new collection, winner of the prestigious Drue Heinz Literature Prize, Darrell Spencer delivers fiction with just that kind of power. Bring Your Legs with You contains nine interconnected stories set in Las Vegas. Featuring various perspectives and narrators, they are filled with unforgettable characters, including Carl T. Plugg, a sharp-dressed, smooth-talking, non-hustling pool shark; Spinoza, the philosophical day laborer with ""Department of Big Thoughts"" lettered on the door of his pickup; Jacob, an arrogant lawyer who learns too late the dangers of swimming with the sharks; Gus, a man who has never seen his son fight despite his insatiable fascination with the sweet science; and Jane, a woman wary of her ex-husband, but still in love enough to share her bed with him. Above them all looms Tommy Rooke, retired prizefighter and self-employed roofer. Undefeated in the ring, Rooke walked away from boxing at the top of his game, to the confusion and consternation of his friends and family. As his father, former manager, and various other hangers-on encourage him to stage a comeback, Tommy moves through the gated communities and sun-blasted strip malls of Las Vegas, wrestling with personal choice, the caprices of fate, and the price the gods demand for our sins. More than a book about boxing, gambling, luck, and broken dreams, Bring Your Legs with You delves deeply into the life of its flowed but intelligent hero, a man deeply devoted to his friends but lost in a violent world. A writer unafraid to show the connections between people, Spencer delivers a hard-hitting collection filled with rich dialogue and spare prose.